For most of you, your audience is clients and potential clients. No matter how sophisticated you think your clients are, if they’re not attorneys they aren’t going to understand legalese. In fact, even if they are attorneys, if they don’t practice in your area they likely still won’t understand you. So who is your Doris? Identify one person who you can think of as you write, then write to that one specific person. Perhaps you’re a construction lawyer, and your audience is engineers, architects and general contractors. Write in their language, not yours. Think through how you would explain the topic to them if they were sitting in front of you, and then write in that style. Generally speaking, clients and potential clients only care about case law and statutes to the extent it impacts their business. With each fact you include from the case, ask yourself if your audience really needs to know that fact in order to understand how the ruling might apply to them. If they do, clearly explain to them why that fact is important. When discussing cases and statutes in your blog, you don’t need your Bluebook. Full citations leap off the page because of the italics and all the numbers, and you don’t want to scare readers off before they’ve even begun to read your blog. If you are using a specific case as an example, or perhaps discussing a recent ruling, keep it simple: Brown v. Smith. Some of our writers have law degrees, have practiced law for years, and they still don’t understand many of the law blogs they read. It’s easy to forget that you didn’t know the meaning of “non-compensatory damages” until law school, but chances are your readers don’t understand legal terminology. While the plain language movement is still having a tough time catching on in the legal world, it’s imperative for your blog. Remember: your blog doesn’t need to stand up in court, and no one will complain that your language was too easy to understand. To view our presentation on winning the battle against legalease, click here. 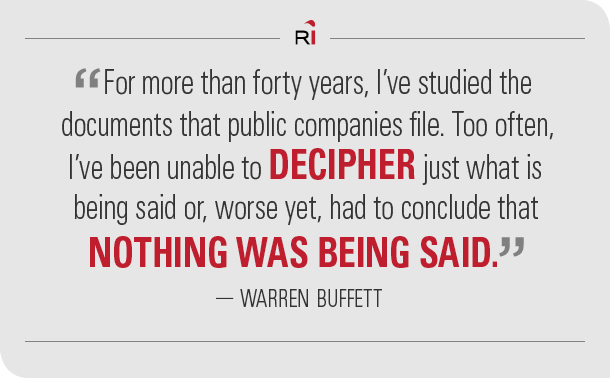 Another problem with getting into the weeds is that you often forget to hack your way back out and clearly state the key takeaways from your analysis. To make sure you aren’t just rehashing information that’s already widely available, get into the practice of both beginning and ending your blog posts with a summary paragraph that ties everything together and clearly explains to your audience why they need to know about this topic. Save footnotes for legal journal articles. I know, it’s second nature to footnote every fact. However, footnotes have no place in blogs. Instead, the best practice for blogging is to use hyperlinks within your blog to credit other sources. 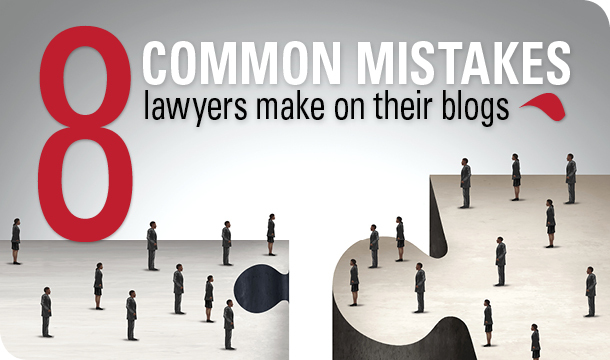 This is a common mistake for all bloggers, not just lawyers. Let’s face it: we’re all in a hurry. Perhaps nothing is more overwhelming to a reader than scanning your blog post and seeing 10 lengthy paragraphs looming ahead of them with no idea where you’re going. (I bet most of you scanned the seven headings in my list before you began reading my post.) They might simply decide they don’t have time for your blog. Subheadings are like a map for your post that prove to the reader they’re on the right path. When properly written, they tantalize the reader into taking time to read your entire post. They also keep you on track as a writer, and they can have SEO value when written correctly. Articles with relevant images receive a whopping 94 percent more views than those without images. In addition, engagement rates on social media are higher when you include an image with your post. Facebook posts with photos (which are generally pulled in from your blog when you place the link in a Facebook post) have the highest engagement with users. In addition, social media platforms such as Instagram and Pinterest are primarily driven by images. You can download some great stock images with monthly or annual subscriptions to services such as Thinkstock and iStock. In addition, there are sites that link you up with photographers who are willing to share their images with you for free. However, it’s very important that you fully investigate sources of free images and ensure the photographer has given a license suitable for your use. You’d be surprised how many lawyers think you can copy an image from any website as long as you credit the source. Photographers and graphic artists can and will sue you for unlicensed use of their work. Blogging can be enormously beneficial to your law practice. Research shows over 80 percent of potential clients will visit your website to assist in their decision of whether to hire you. In fact, they’re more likely to search you on Google than to ask a friend or colleague about your business. How do you ensure potential clients find your website? Ranking high on Google for keywords related to your law practice is key, and blogging can improve your ranking dramatically because it constantly creates new content for Google and other search engines to crawl and identify as relevant to particular keywords. The first result is Florida’s statute regarding condominiums. 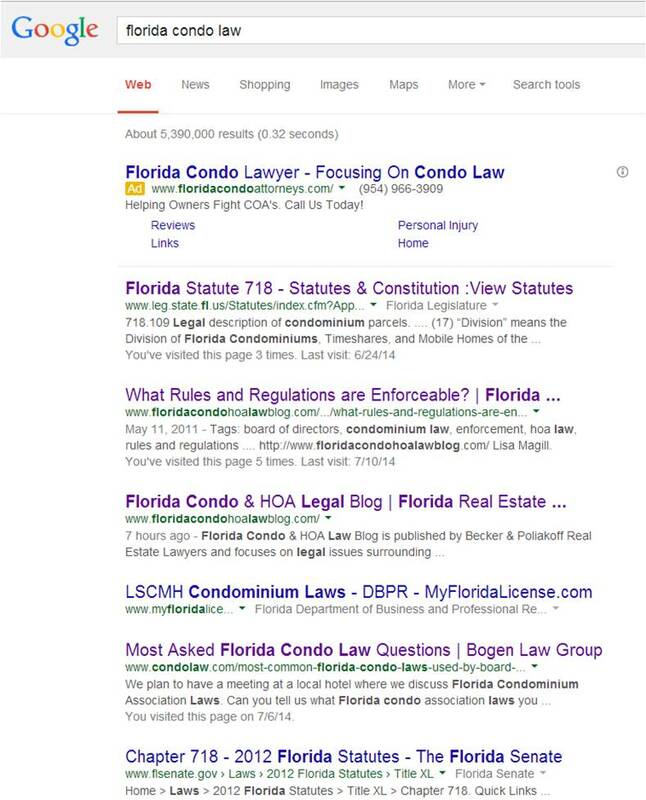 Both the second and third results are from a condo law blog run by law firm Becker & Poliakoff, the fourth is the Florida Department of Business and Professional Regulation, and the fifth is another law firm who maintains a list of commonly asked questions about Florida condo law. You can often work your way up the Google results very quickly by simply blogging on a regular basis and using keywords in your blog titles and posts that potential clients would be most likely to search. What constitutes blogging on a regular basis? Generally speaking, it’s not worth maintaining a blog if you’re not posting at least once per week. 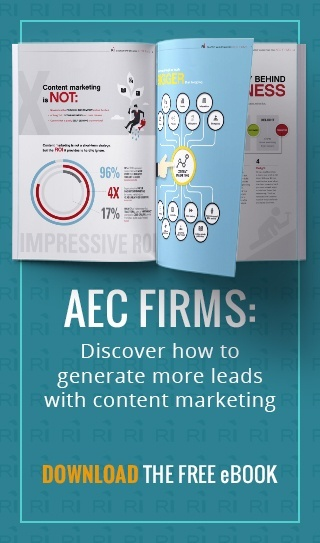 If you can generate quality content more often than that, even better. We suggest forming an editorial board and assigning the bloggers within your group set days they’re responsible for posting. Thanks to Google constantly changing its search algorithm, some blogging best practices change over time, but the basic advice I’ve given here is likely to never go out of style. Click here to download a presentation I recently gave to the Jacksonville Bar Association on how to start a law blog or email me at michelle@rep-ink.com and I’ll be happy to send it to you.